Best Android Lookout : Asus Google Nexus 7 tablet - Android 4.1 " Jelly Bean "
Asus Google Nexus 7 tablet - Android 4.1 " Jelly Bean "
Google in collaboration with Asus finally released their very own tablet Nexus 7 mid July 2012 running on the latest Jelly Bean 4.1 Android OS. The Nexus 7 Android tablet is expected to reach Indian markets by September, but its available on ebay for around Rs. 16,000 (8 GB version) & Rs. 20000 (16 GB version). But the US pricing of the Nexus 7 is 199$ & 250$ for the 8 GB & 16 GB version respectively, so you have to pay Rs. 5000-6000 more or less to get the Nexus 7 before it officially releases in India. Using a Nvidia Tegra 3 chipset , the Nexus 7 Android tablet is capable of easily supporting the latest games made and even the future games well. HD videos will play flawlessly on this android tablet. Advice: People buying the Asus Google Nexus 7 tablet online in India or other countries where it is not officially launched have to face the fact that Asus will not be giving any support to them until the official release in one's country. -GSM/ CDMA networks not supported no call, sms or mms support. -Wireless LAN (Wi-Fi) 802.11 b/g/n. -Android OS 4.1, Jelly Bean. -Nvidia Tegra 3 T30L chipset. -Quad core 1.2 GHz Cortex A9 processor (1.3GHz in single core mode). -ULP Geforce 416 MHz GPU. Advice: The Nexus 7 tablet will be able to run almost all of the HD games, it uses a 416 MHz ULP Geforce GPU. The GPU is only a little underpowered when compared to the expensive Android devices Asus Eee Pad Transformer Prime, IdeaTab K2 / LePad K2, Acer Iconia Tab A510, Acer Iconia Tab A700, LG Optimus 4X HD, HTC One X, ZTE Era, ZTE PF 100, ZTE T98, Toshiba AT270, Toshiba AT300 (Excite 10), Asus Tablet 610, Fuhu Inc. nabi 2 Tablet, Tesla Model S which are powered with Quad core 1.4 GHz Cortex A9 processor (1.5GHz in single core mode) with 520 MHz ULP Geforce GPU and ASUS Transformer Pad Infinity 700 (TF700T) which uses the same 520 MHz GPU and a 1.6 Quad core Cortex A9 processor (1.7GHz in single core mode). But most of those cost more than the Nexus 7 and plus you get Jelly Bean 4.1 out of the box for the Nexus 7, thus making it the best for its price. - LCD capacitive touchscreen with LED backlit and IPS technology, 16M colours. - 7 inch screen with Gorilla Glass. - 800 X 1280 resolution with 216 ppi pixel density. - 1 GB DDR3 RAM @ 667MHz. - No memory card slot. - 8 GB or 16GB internal memory depending which version you buy. - USB OTG is for only some device types, presently USB storage is not supported (You may have to " root " your Nexus 7 tablet and use " Stickmount " application as experimented by some people ) . Advice: Only go for the Nexus 7 android tablet right now if your fine with the internal memory, because updates to the USB OTG are nowhere in the news right now. Off course if your comfortable with storing files using the Cloud, you can go ahead. Memory is @ 667 MHz again is a bit less as compared to high frequency of the Asus Eee Pad and others but with Jelly Bean 4.1 as the new OS, everything will be butter smooth. -Front facing 1.2 megapixel camera as the primary camera for video chatting. -No camera for clicking pics. -The battery used here is a Standard Li-Ion 4325 mAh. - If the Nexus 7 android tablet not officially launched in your country, you should wait a little more because you'll end up paying extra dollars if you buy it online. - In India you have to pay Rs. 5000 - 6000 more for the 8 GB version, so a total of around Rs. 16000 and around Rs. 20000 for the 16 GB version of the Nexus 7 Android tablet. The actual price of the tablet in US dollars is 199$ & 250$ respectively for the 8 GB & 16 GB versions. - Jelly Bean 4.1 is the latest Android OS and its the best among the rest, so its a complete worth. Watch the review of Jelly Bean 4.1 here. - Jelly Bean 4.1 uses the hardware perfectly, so it should perform better than the expensive devices having high end hardware but running on Ice Cream Sandwich 4.0. - The Nexus 7 is a total worth for its price, even though certain features like hdmi out and micro SD card are not supported, you will be able to run almost any application and game given the hardware. - Its Google's very own Android tablet, so it will receive updates easily without any fuss. Google has always given first priority to its Android devices like Jelly Bean 4.1 is latest and its out first on Samsung Galaxy Nexus & even Samsung Google Nexus S is confirmed to get Jelly Bean Android 4.1 even though the phone is almost 2 years old. Hence Google has proved that it will keep its devices up to date with latest software. 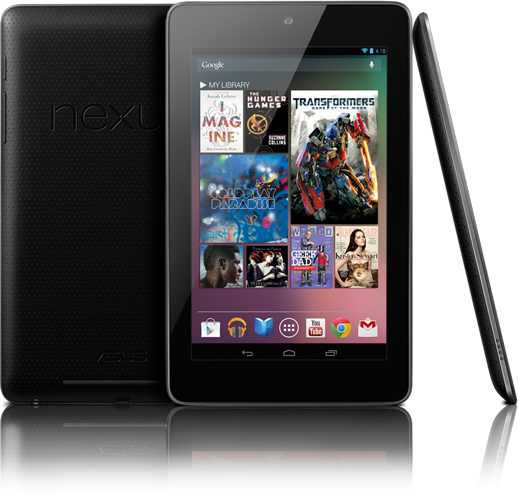 I will update the prices of the Nexus 7 Android tablet and availability in my future posts so keep visiting :-) !